What is a USB dead drop? ‘Dead Drops’ is an anonymous, offline, peer to peer file-sharing network in public space. This network is made up of USB drives that are embedded in walls, buildings and other public places. Anyone is free to access, download, and upload. It is very similar to geocaching but with data. The first USB dead drop network of five locations was created by Berlin-based artist Aram Bartholl in 2010. 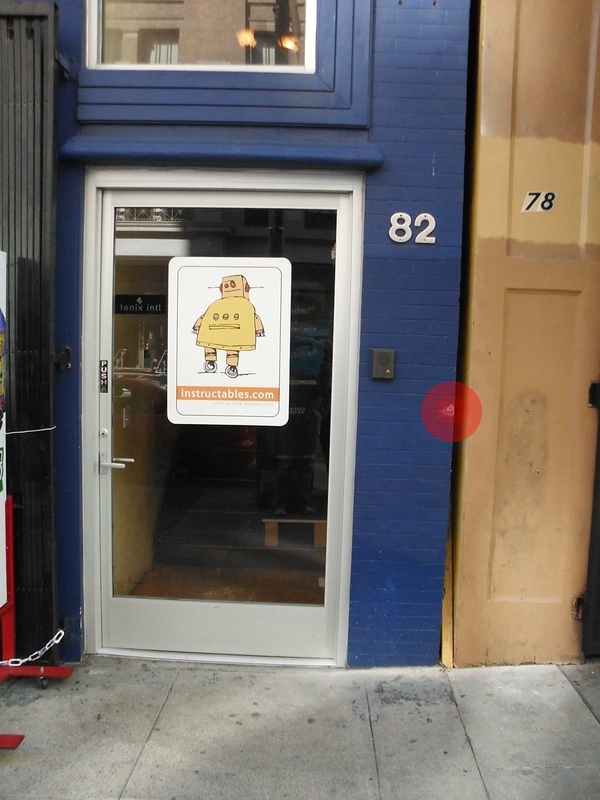 Since then, there have been over 1,000 dead drop locations that have been registered at deaddrops.com (Including one outside the Instructables office.) For a walk through of how to set up a standard USB dead drop, check out this instructable by user frenzy. Up until now, this has been mostly restricted to urban locations. In this instructable, I am going to attempt to expand this project beyond city limits by showing everyone how to embed USB drives in natural fixtures such as trees and rocks. The first step is to open up the housing of the flash drive and remove all the unnecessary plastic. You can usually pry open the housing with a small screw driver or knife. Another option is to just squeeze the housing with a pair of pliers at the seem. Continue removing parts until only the USB connector and the circuit board remain. Applying a layer of plumber's tape around the circuit board of the drive helps to keep it a little more protect. Don't go overboard, one or two layers is plenty. Select a dead tree to locate your deaddrop. I do not recommend using a healthy tree for this project. In addition to the damage caused by drilling, the cavity that you create also provides a potential site for mold, rot and insect to take up residence. Because of this, I recommend using a tree that is obviously dead, fallen over, or just a stump. The USB connector and board of a typical USB drive is about 0.51inch (13mm) wide x 0.20inch (5mm) thick. There are a number of ways that you can drill out a slot to accommodate for it. The simplest and fastest method is to drill a single hole that is large enough to fit the whole drive inside of it. A 1/2" drill bit will usually suffice for this. If you want to make a smaller imprint on the surface and make the end product look a little cleaner, you can drill a series of smaller holes in a line to make a slot. Each hole should be the same thickness as the USB drive (about 1/4 inch). Then you can finish the shaping with a knife or file. Be sure to drill your hole is a part of the tree that is solid and free from rot. Clear the saw dust and wood shavings from the hole by blowing on it. Then fill the hole most of the way with wood glue. Slowly insert the USB drive into the hole until the back edge of the metal on the connector port is even with the surface of the tree. Some of the glue will squeeze out around the edges. Wipe off the excess using some nearby leaves. Once the glue dries, you have a USB deaddrop site out in nature. If you wish to prolong the life of the drive, you can put a cap on it to at least partially protect it from the weather. The last step is to upload the instruction text files and any other files that you want to share. You can find the readme file here: http://deaddrops.com/download/readme.txt. You can find the dead drop manifesto here: http://deaddrops.com/download/deaddrops-manifesto.txt. I also decided to also load a copy of "The Giving Tree" by Shel Silverstein onto the flash drive (Yes, I got the idea from this xkcd comic by Randall Munroe). To document the dead drop location, it helps if you take three pictures of the location (up close medium and far away). This makes it easier for others to find your dead drop. You don't need to limit yourself to just trees. You can also setup a dead drop in stone. The process for this variation is identical to the original procedure that is used for brick and mortar locations. Just find a relatively soft rock, drill the hole with a mortar drill bit and use concrete patch or fast drying cement instead of glue to fill the hole. When you get back home, you can register the dead drop location here: http://deaddrops.com/dead-drops/db-map/.. This helps others to find it. Then check on the dead drop periodically to see if it is still working and if it is being used. As with all files of unknown origin, always be careful to avoid viruses. Because of the risk of viruses, it would be cool to make a raspberry pi portable to use for Dead Drops. Read only would be a better idea. I can only imagine what some sick pervs would upload. geocachers tend to be responsible and unlike this. The point of this is to take something and leave something that says you were there. you'd be suprised. We found some nasty stuff in a geocache in Italy. Available in lots of sizes (so any budget) and quite sturdy - nothing to have to take apart! Also, use a non-water-solulable glue, maybe epoxy or in a pinch, hot glue. Fun idea! Cool idea.. it seems that flash drives are so cheap these days, they could also be used like the whole "read a book, leave a book for a stranger to discover" thing. My problem is, I'm weary of even purchasing a flash drive from 3rd party sellers (eBay, Amazon), let alone this, of course I'd find people who would appreciate this to be trustworthy since it never caught on into the mainstream. I like that whole ragtag offline network feel of it. Almost reminds me of the local BBS days in spirit. Isn't this toxic? Rain, the elements, and bacteria, heat and sun could break down the internal components and leak it into the environment including mercury and fire retardants found in common electronics. Not to mention the white glue itself. There is a reason these things are to be disposed of in hazardous waste. Just wanted to say congratulations on being a finalists in the Great Outdoors Contest! This was a fantastic instructable! (I laugh every time I read the cartoon) Good luck! That's my mom's favorite book. Perfect for a dead drop in nature... naturally. Help me out. I find this interesting, but struggle with the motivation. Why would I want to do this? What sort of files are being shared? Anything I am aware of in the public domain is widely available and anything copyrighted is illegal to share like this. I wouldn't consider putting a USB anything in my machine unless it has been in the continuous possession of someone I trust. Geocaching is like a treasure hunt, you follow the gps or the directions to find the location of the cache. Then you leave your signature or some object behind that says you were there. You can log the ones you have found, etc. Its a hobby for exploration. I understand the concept behind it - the original treasure hunting aspect that is, but this digital version involving files and such is what I don't comprehend nor do I see a point in continuing. Totally agree. This makes absolutely zero sense. It would just take one random person to put malware on one of the drives, and it would spread quietly not only to every other person who connected to it, but to every other drive they connected to. I can't believe people can be this irresponsible with expensive machines. On top of that, anyone who is a "naturalist" would freak out to find any sort of man made object embedded in a rock or tree when on a hike. In fact, unless it is your own property, doing this could be highly illegal, and I definitely wouldn't want any random people on a "treasure hunt" on my property. Malware or a virus would require you to actually run executables from it, which in modern version of windows it won't even do when autorun is enabled unless you specifically tell it to. That's somewhat true.... but consider something like the U3 System on "smart" USB Drives. That will automatically install (quietly, in the background I might add) every time you plug it into a machine, no matter if you uninstall it from the computer or disable autoplay. The only way to stop it is to completely wipe the drive so it no longer exists. It wouldn't take an expert programmer to come up with something similar for malicious purposes.